Car 500 runs again on own power! Parlor car 500 went back into service in January 2017. It is considered the museum’s most precious possession and almost the last surviving car of the aristocratic breed of trolley. The car was built in 1904 by the J. G. Brill Company No. 500 for the president and other high officials of the Connecticut Company. The car is powered by four GE – 80 motors and uses a CP27 compressor to provide braking power. All four motors where re-built as part of the recovery work from Hurricane Irene. The project was funded 25% by the museum and 75% though our FEMA disaster assistance award. 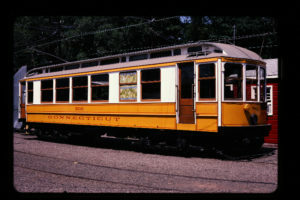 The car was purchase d to meet the requirement of the president riding about the trolley lines in Connecticut. 500 was also the first car to make the trip from New Haven to New York via interconnected trolley lines in 1912. Very few trolley companies could afford such a large and comfortable car for their president. 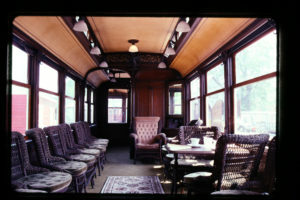 The car contained a sitting parlor, rest room and a small dinette for making light meals and drinks while traveling. Car 500 has wide platforms on each end of the car, they were open when built but closed in about 1914. The motorman has a little (and we mean little) glass-enclosed cab at the right side of end. It has some special features of a voltmeter, ammeter and a speed meter on the dash.